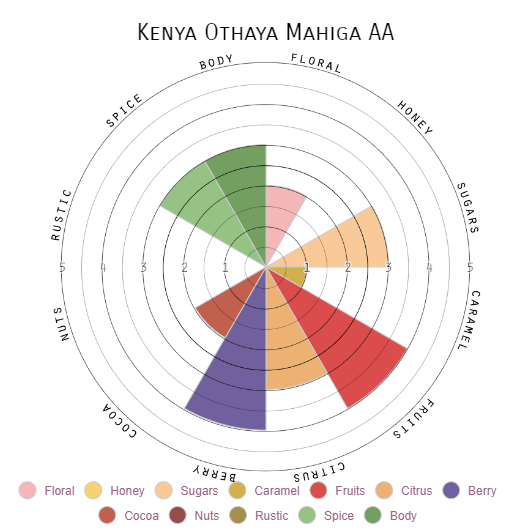 Mahiga shows both tart and dark fruit undertones and is juicy, notes of floral blueberry, grape and cranberry juices, dark orange, blackberry juice, along with tart acidity, and spiced finish. 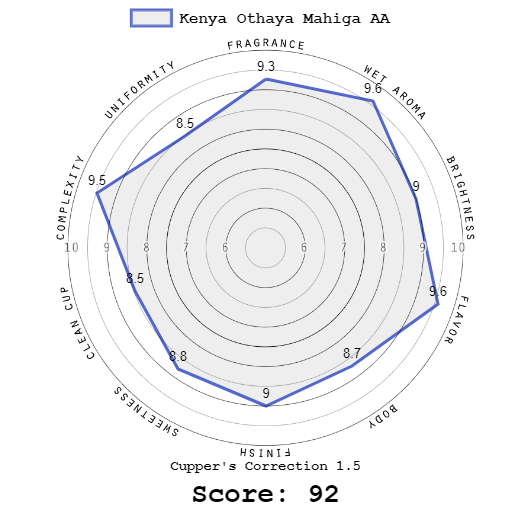 The Mahiga Factory washing station is right at 1800 meters elevation in the Othaya region of Nyeri County. The Othaya Farmer's Cooperative Society has 18 mills and they have been farming coffee in this region since the 1950's. They have established a well flowing system of sorting and processing the beans to keep batches separated and to sort the beans by quality. This allows us to purchase only the uniform, top-rated AA beans to produce the finest cup of coffee. These beans are mechanically depulped before fermenting the mucilage off and then they are soaked and rinsed in fresh water and dried on raised beds.